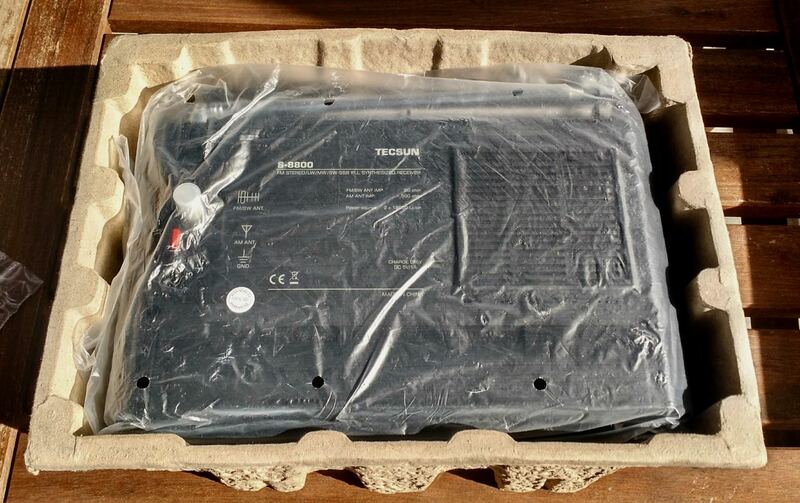 Yesterday, I received a Tecsun S-8800 from Anon-Co in Hong Kong. I like opening radio boxes to find a cardboard insert like this one. 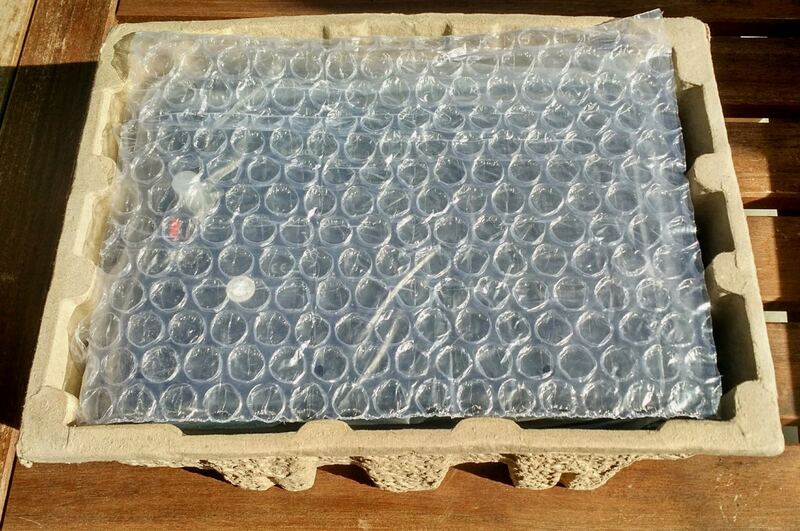 It protects the radio and has so much less waste and individual cardboard bits inside. Because I’ve worked with Anna at Anon-Co for at least a decade, having purchased numerous radios for review and as gifts for family and friends, this was difficult to refuse. I decided there was no need to do so. Each time I do an in-depth review and note shortcomings or deficiencies in the radios I’ve purchased from Anon-Co, Anna immediately passes my feedback and criticisms directly to the manufacturer’s engineers. I believe this feedback loop between customers, reviewers and manufacturers leads to improved product iterations. Of course, sometimes the negatives can be so problematic, manufacturers simply drop the product line and move on (remember the Tecsun R-2010D? Case in point). So, while there are a number of other eBay retailers in China that distribute Tecsun radios, I prefer Anon-Co for these reasons. The S-8800 is packed face-down to protect the front panel. Manufacturers and retailers who send me products for review know that we radio geeks have fairly high expectations of our gear, and will therefore hold them to exacting standards. I’m not the least among these. While I endeavor to be realistic, understanding producers’ limitations and the need for product growth, I also try to keep my reviews as objective as I can, and accommodate my own and others’ particular requirements and preferences. 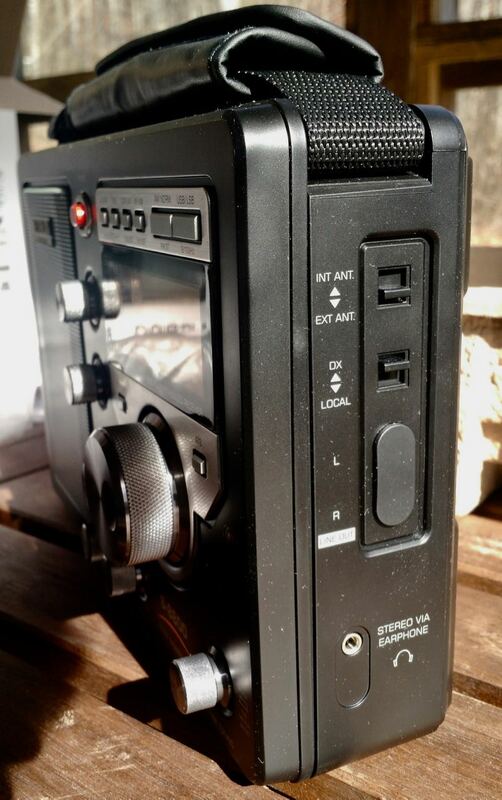 So In the spirit of full disclosure, I must note that I’m not as avid a user of large portables like the S-8800 (or the Grundig GS350DL, S450DLX, or the C.Crane CCRadio-SW). Personally I prefer smaller, full-featured travel-friendly portables, or else larger tabletop models. 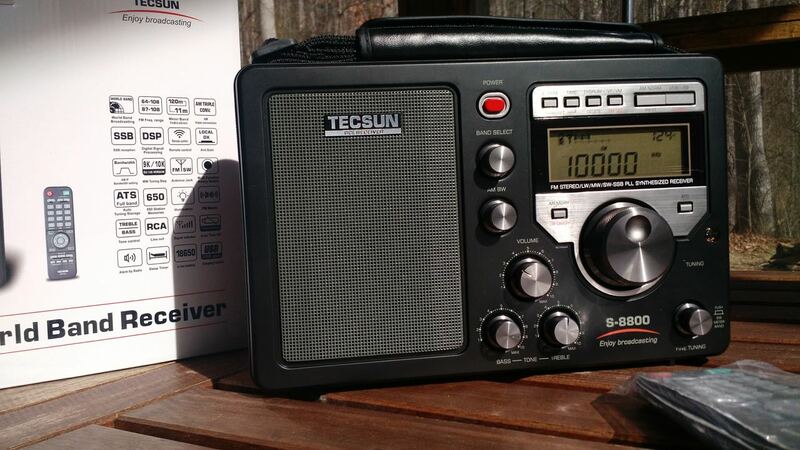 Radios with a form factor like the Tecsun S-8800 are an “in-between” product in my world, thus I rarely use them. That said, every month I receive questions from readers looking for this very “large portable” form factor. Some hobbyists enjoy a radio that’s easy to operate, featuring simple controls, robust audio, and dedicated external antenna connections. For these listeners, a large tuning knob and generous display are more important than things like SSB and synchronous detection. In other words, they want a broadcast receiver. Some have literally asked for a modern version of the venerable Panasonic RF-2200 (which I admittedly love, an exception to the rule of my avoidance of large portables). In terms of aesthetics, it’s impossible to live up the legendary solid-state RF-2200, in my opinion…kind of like comparing a modern muscle car with the 1960s original from which it copies its design. The S-8800, and its many predecessors, were certainly influenced by the RF-2200’s popular design & form factor: large speaker on the left, large tuning knob, wide-spaced knobs, and a generous display. Like the RF-2200, it has a durable, adjustable woven carry strap. The S-8800 ships with the accessories in the photo below: an IR remote control, two rechargeable cells, an RF adapter, and a USB charging cable. Note the charging cable is only a cable; the S-8800 doesn’t ship with a wall-wart type charger. If you’re like me, you probably have a handful of USB chargers scattered around your home that you could use for the purpose of charging this radio. 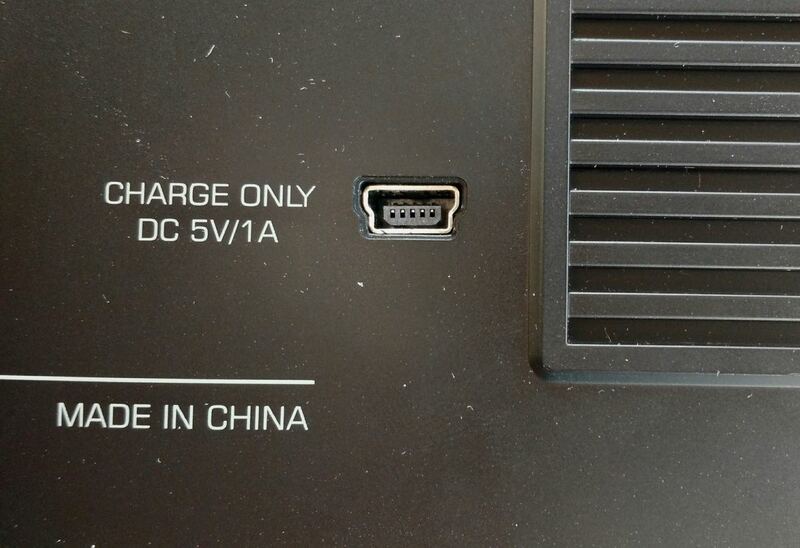 And if you don’t, you can also use any free USB port on your PC to charge it. USB chargers are cheap and well-known to spew RFI. I doubt you’ll enjoy listening to shortwave or mediumwave/AM while charging the S-8800’s internal cells. 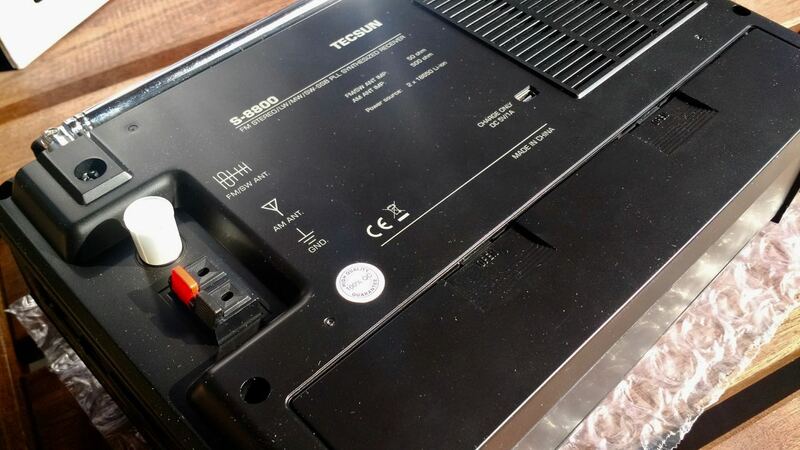 It doesn’t appear the S-8800 was designed for listening while plugged in; Tecsun clearly wants you to charge it and then listen, off battery power. The latter is my preference for listening anyway, but it may put off some potential S-8800 owners. The display is easy to read from any angle, and it’s also easy to view in bright sunlight. In low light, you’ll be pleased with the backlight function. 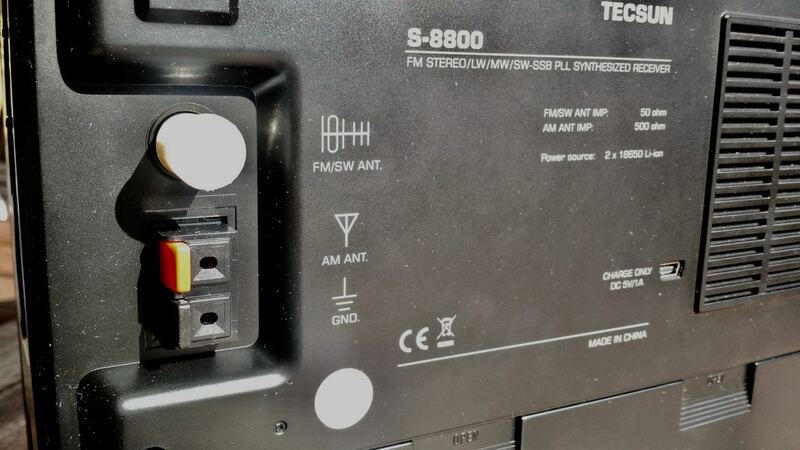 On the right side of the S-8800, you’ll find an internal/external antenna switch, a DX/local switch, RCA type stereo line-out ports (covered in the photo above) and a stereo headphone jack. On the back, you’ll find a mini USB port for charging, an antenna port for a radiator and ground wire, as well as an FM antenna port. The battery cover is predictably located at the bottom of the back panel and––a first for any shortwave radio I’ve reviewed––accommodates two (supplied) 3.7V Li-Ion (internally) rechargeable cells. The right side panel has no connections or controls. 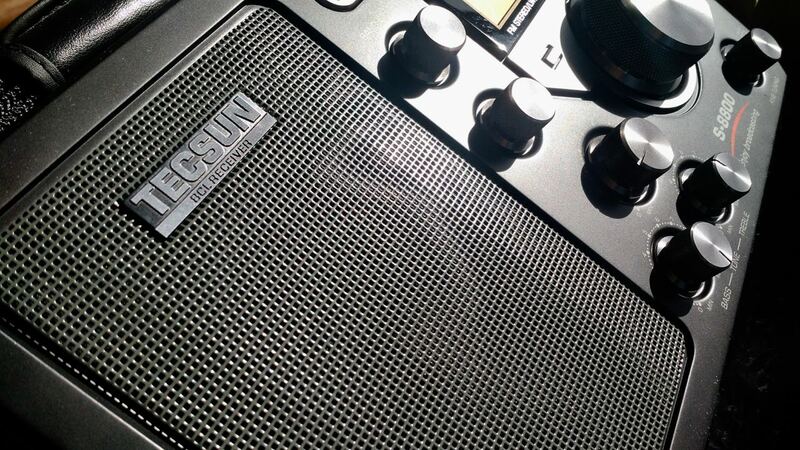 I must admit…the Tecsun S-8800 has some front panel controls I really appreciate. Most notably, it has a dedicated AM bandwidth selector and fine tuning control. I also like the dedicated treble and bass controls which can also be found on its predecessors’ front panels. Over the next week, I’ll be evaluating the performance of the S-8800. I plan to post blind audio samples as I’ve done in the past, comparing the S-8800 to other portables: likely the PL-880 and the ICF-7600GR, PL-660 or PL-680. Please be patient, however, as making these recordings takes time as I like to make sure each radio has a true representative sample and fair shot at showcasing performance. What about those initial impressions? Yes, I must say I do like the package of the S-8800 better than its predecessors. I like the dedicated IR remote control, the many antenna connections, and, so far, the audio fidelity from the built-in speaker. Makes for a nice package. But, ultimately, the proof is in the pudding: let’s put the S-8800 on the air and compare it with some benchmarks! 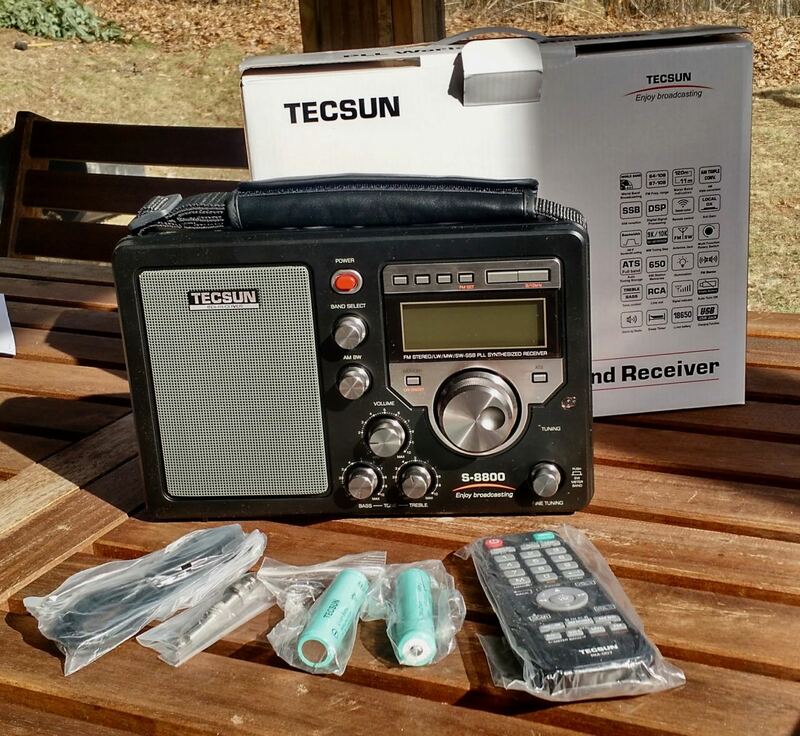 This entry was posted in AM, FM, Mediumwave, New Products, News, Pirate Radio, Radios, Reviews, Shortwave Radio and tagged Anon-Co, S-8800, Tecsun, Tecsun S-8800 on February 1, 2017 by Thomas. There’s no shipping date on these yet, but when they’re available, I’ll announce on the site. I reviewed the Instruction manual for the new Tecsun 8800 and it’s the identical Triple Conversion architecture as the Tecsun PL/880! This should make for a pretty amazing receiver. Any idea on pricing? I have been to anon co and everywhere else, gut instinct can not find anyone selling the 8800. The 350 May be my all time favorite radio, EXCEPT FOR THE REDICULES amount of drift. Love the dsp, 18650, and remote upgrade. I really,really , reallllly want one of these! I believe Anon-Co will have these available by end of February/early March. Again, for those wanting to use an active antenna or a Wellbrook loop on MW or LW, the BNC connector does not allow this. It is only for the FM and SW band. So the radio is loosing some of it’s usability for MW / LW dxing because of this. A high impedance long wire can be used instead (on the other connector) but there are no support for 50 ohms loops and active antennas below SW and that is is a loss. Thanks for your observation. This disqualifies the S-8800 from my consideration. too bad, It would have been on my short list. If it did work below SW, It would be in my mailbox. Hopefully Tecsun will take this up in their next model. Does the PL880 work with active antennas? It is the runner-up on my list. 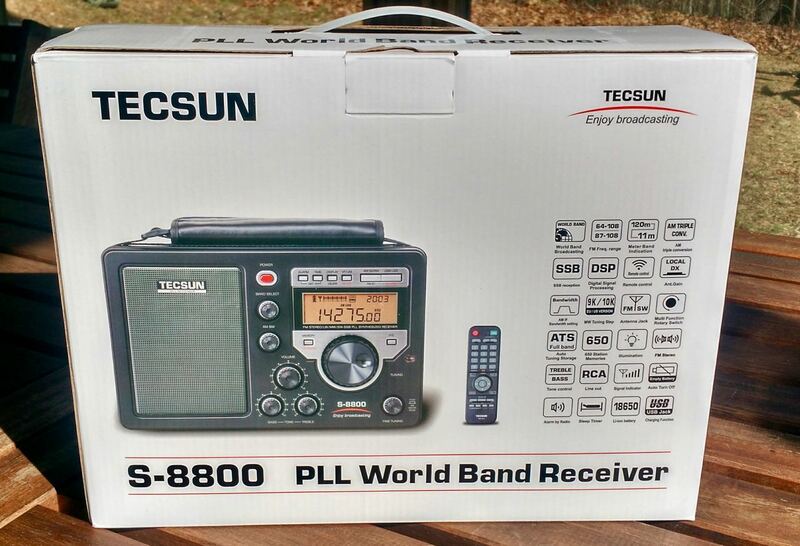 If we are talking about the Tecsun PL-880 below shortwave, i.e MW and LW, no it doesn’t work with active antennas or any external antenna for that matter. Somehow, Tecsun seems to think good antennas are less important at the lower frequencies. You have only one choice on those bands on the PL-880 and that is the internal ferrite bar antenna. If you plug in an external antenna into to the ext antenna jack, it works on SW, but nothing happens on MW / LW. However, this radio can be modded so that it will work. But as for now, I know too little about the S-8800 to say that it will be possible to modd that radio allowing the BNC to be used for 50 ohms external antennas below SW. 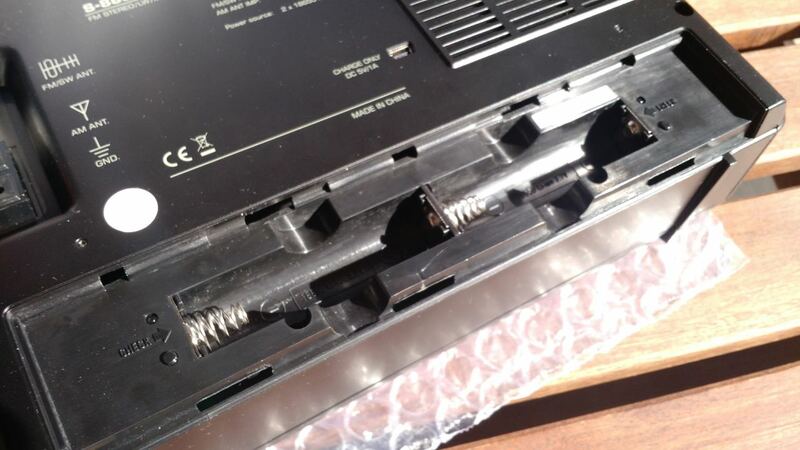 It is quite frustrating Tecsun continues to do these manufacturing errors again and again. 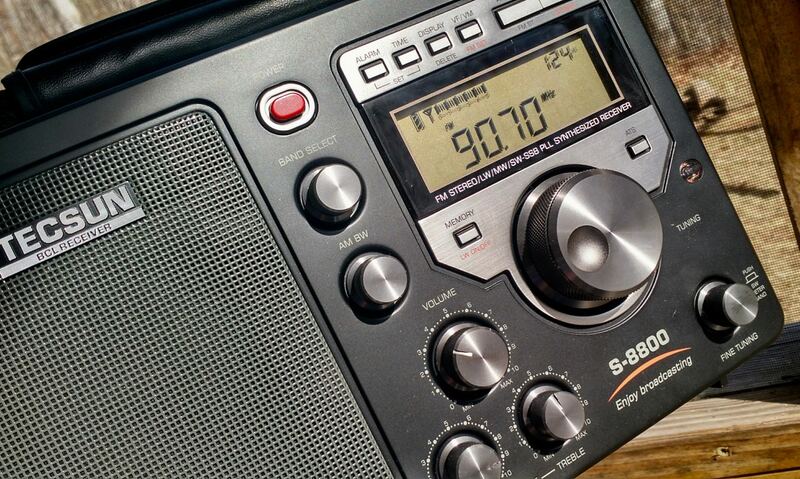 It is almost as some aspects of their radios are designed by non-competent people. Your observation is valuable for me making a buying decision. It would be nice if they could provide schematics for those who want to modify. I am sure if the radio works, the incompetency is not in the engineering department but is, and my personal experience in tech reveals the problem resides in the marketing department not knowing/understanding features their buyers want. NOW if marketing is competent they most likely will come across swling comments and see how they could accommodate the people who independently review their products. For now I am ruling out Tecsun based on the various reviews. We vote for their products by putting our votes(dollars) in Tecsuns ballot box (cash register). But this time around I will pass. It was soo close. First off, connecting a low-impedance antenna to a high-impedance input is usually not a huge problem for receiving antennas, but the SDRplay RSP owners are facing the same problem, the main (V)LF through HF antenna port is now “Hi-Z” and from there comes an easy solution: <$10 buy you one of those little NooElec 9:1 baluns. Using that "in reverse", you can connect your coax via SMA to the balun, and the balun via 2 short jumper wires to the Hi-Z input – tadaa. Additional benefit is yet another instance of ESD protection on the little PCB holding the SMD balun. You’ve said that you don’t like these large portables as much as smaller radios; this leads me to ask if there is a benefit to being able to receive while using a radio like this that probably has a bigger built-in antenna, as well as with external connected antennas. I am currently having a lot more trouble receiving strong signals with a small radio than I originally planned, and although money is an issue to some extent as I’m just getting started, I’m coming to the realization that I might have to get something better to be able to understand enough of the broadcast to keep me interested. Actually, Carlos, that’s just my personal preference because I own large tabletop radios and even “portable” tabletop radios like the CommRadio CR-1a. 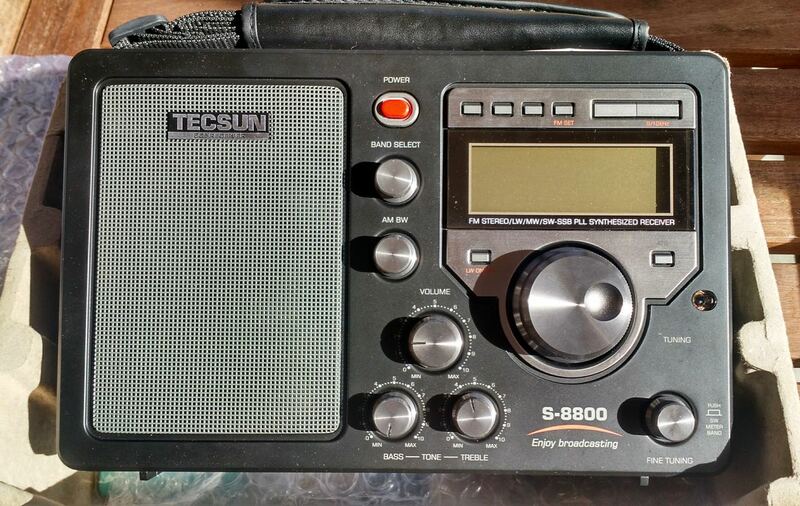 It sounds to me like a Tecsun S-8800 form factor might be a good option for you. I do really love the fact it has more connections, more versatility and better audio. Sorry I haven’t been able to keep up with comments! 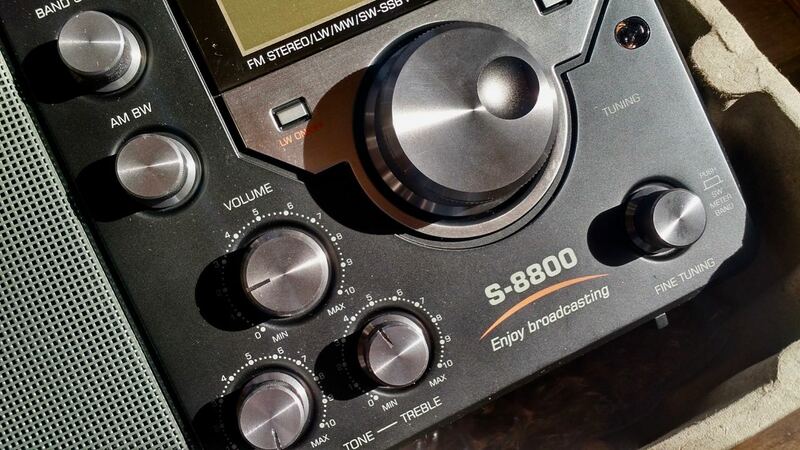 My S-8800 covers longwave from 100 kHz to 519. It does not tune below 100 kHz into the VLF range. Yes, but do SSB work at those low frequencies too? I’ve started doing comparisons with other receivers. So far, the S-8800 is not disappointing me. The audio fidelity from the internal speaker is impressive and room-filling. 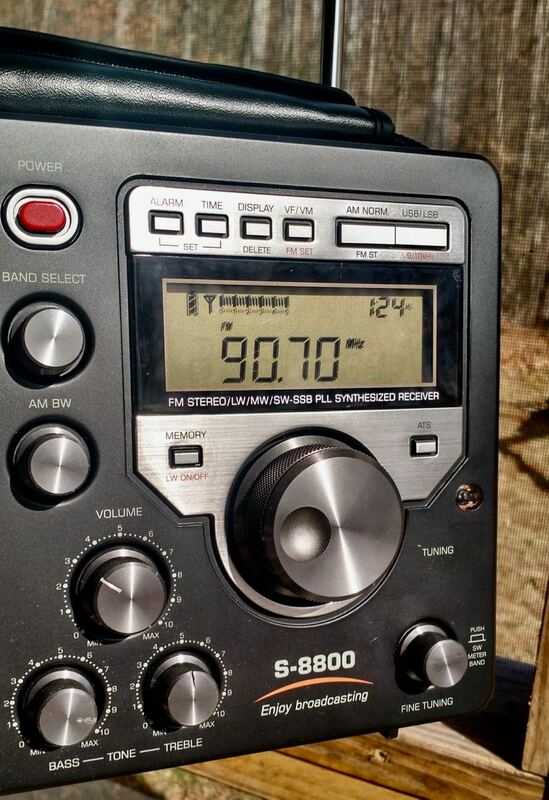 Yesterday, while working outdoors, I listened to Zanzibar, Voice of Greece and Radio Guinea music. I think the best way to test, though, is to make recordings with my Zoom H2N in-line. I will post a blind audio comparison likely next week. Thanks for the post Thomas. 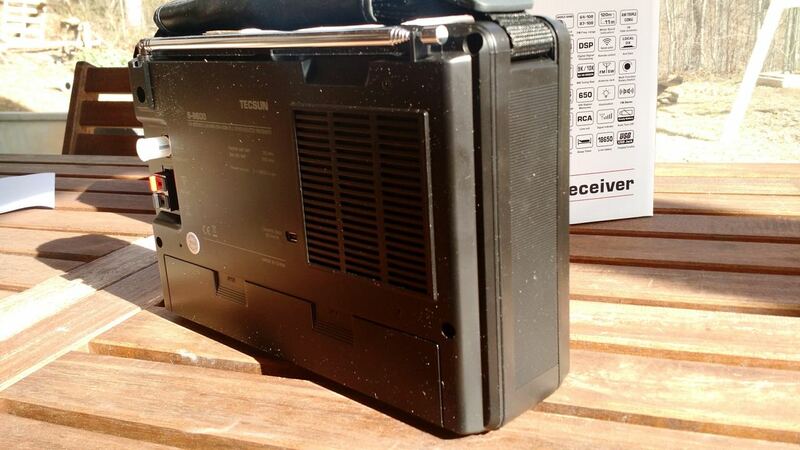 This radio is so reminiscent of the Panasonic RF-2200 in its design. Interesting old-school connectors for ground and MW, reminds me of the ones on the Yaesu FRG-7. BNC connector for LW/SW somewhat unconventional too, but easy to get used to, and with adapters you can attach many different types of antennas. The soft cushy-looking carrying handle just begs you to grab it and take into the field or outside on the deck. I like it so far and am looking forward to your review. Thanks for your detailed unboxing and initial impressions, Thomas. I don’t know if you have any around, but it would make a better “apples to apples” comparison in your review if you could pit the radio against a S450DLX or CCRadio-SW for instance. I think it would especially make for a valid comparison when it comes to the audio quality. That said, I know the PL-880 will be a strong competitor in terms of pleasant audio. I can tell you now, however, without a doubt, that the S-8800 can receive circles around the 450DLX. I suspect it’s more sensitive than the CCRadio-SW as well. At first glance it looks like its predecessor. I sure you will do your usually detailed review and point out any differences or improvements. Looking forward to your assessment. Is it true that SSB does not work below 1621kHz vs. 1710kHz?. If yes, there is no point having a VLF version, so hope this is not true. The Wellenjagd website does not say anything about this. It only states that the SW band in the 8800e version is 1621-29999 kHz and that the LW band is 20-521 kHz. I don’t see any reason to assume that SSB is limited to SW band. Unfortunately, I can already see one design flaw on this radio You can use the high impedance antenna connector for LW, AM and SW (good), but you can only use the 50 ohm BNC antenna connector for FM and SW (bad) . That way, you can’t use active antennas for neither AM or LW. I am looking forward to your audio comparisons … and to see it finally listed on Anon’s web site so we know its price! I assume this one is different from the German “TECSUN S-8800E WELLENJAGD EDITION” with VLF that has previously been released(?). 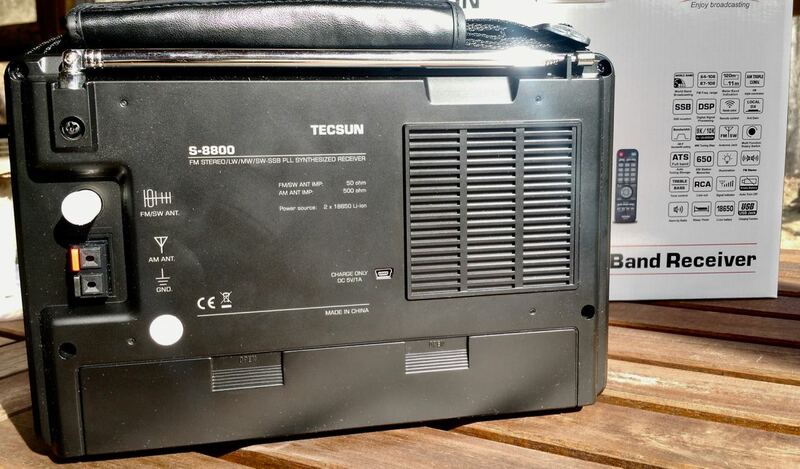 For anyone interested, I looked up the German “TECSUN S-8800E WELLENJAGD EDITION” with VLF. That has a Power Button … the Power Button signifies Thomas’ model is not the S-8800E WELLENJAGD EDITION”. (4) It’s listed that charging works while the radio is “on” unlike the standard edition (I’m sure Thomas can confirm … but why would you want to do both and introduce more RFI?). Sorry, the blog didn’t like how I formatted my reply above with the use of “” & omitted my text! The e edition has a Green Power Button – the standard edition has a Red Power Button (like Thomas’ radio). The Special or exclusive color of the knobs of the “e” are Gun Metal. This leads to the question whether the S8800 version has any LW band at all. 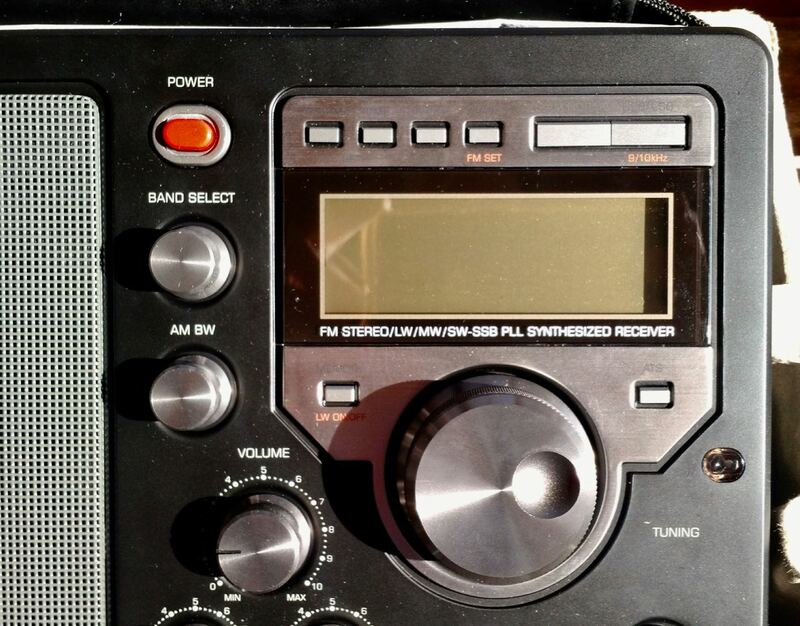 Many Tecsun DSP radios have just a fake LW band with no sensitivity at LW broadcast band due to missing LW antenna.